Join us! Open House on June 30, 2017. Morning coffee 9 – 11 followed by a tour of beautiful Bucks County and Hunterdon County. Drive starts at 11AM sharp. Taking advantage of El Nino’s effect on the Fall weather in NJ we hosted a couple of Ferrari and exotic car rallies during the height of seasonal fall foliage gathering at Exoticars USA and rallying to a 4-star lunch. 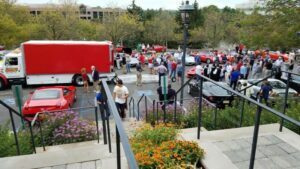 Exotic car events – Open house and driving events are held year-round at Exoticars USA. To register and stay informed of events, please sign up for our newsletter here: Subscribe to our newsletter. Join us on a drive Sunday November 13, 2011. The last event was a big success so we’re offering it again.